For some people, dark circles under their eyes come and go depending on how much sleep they get. It’s not a big deal, and not something that particularly bothers them. But for others, dark circles are a chronic problem that won’t seem to go away. No matter how much sleep they get, their under eyes just seem to stay dark and sunken. While dark circles may be genetic for some people, there are certain things you can do with your private label skincare to help lessen the appearance of dark circles. While we can’t promise they will be completely eliminated, it’s worth a try to at least help diminish what would otherwise be striking and bothersome dark rings below the eyes. If your dark circles are not related to things like your water intake or rest, then you’ll want to turn to special private label ingredients for some extra help. For example, your under eyes may be struggling due to thin skin. In that case, you would want to use a combination of plant based retinol and a high quality vitamin C to help your skin strengthen and for adequate collagen to be produced. The result would be more plump, firm, and less thin and paper-ey skin. 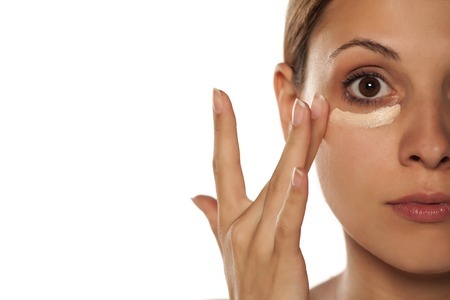 For some people, dark circles occur under their eyes as a result of increased pigment. This can result from too much sun exposure or inflammation. In this case, you will want to use an approach that combines private label skincare products and ingredients that are anti inflammatory and help with hyperpigmentation. Those ingredients just happen to include plant based retinol and vitamin C, but go beyond these two ingredients to include essential oils like frankincense and chamomile. Keep in mind that transformation of your eye area may take some time. In an era where instant results are on everybody’s wishlist, it’s important to remember the value of slow and steady. Daily application of a high quality private label eye cream that includes ingredients like vitamin C, non-irritating plant based retinol and strategically added botanicals such as frankincense and chamomile can have very noticable effects over time. Initially you may experience increased skin softness, and over time the results will get better and more comprehensive. If you have dark circles under your eyes that you haven’t been able to make go away, don’t let yourself feel defeated! There are things you can do to help your skin look its best, even if it takes a little bit of time.